Sounds familiar this time of year. But remember that the little minx Wendy who is inventing these names doesn’t care about you. What they care about is separating you from your hard earned cash, whether you need it or not. You don’t need to shop the sales. You don’t save any money buying something at a discount that you then don’t use. Buy things when you need them and will use them. You don’t need a special day to shop small local businesses. Shop them all the time, when you need the things that they sell. It is worth paying a little more to keep them in business throughout the year so they are there when you need them. Sometimes, saving that 25c doesn’t do much good for the world. You don’t need a special day to shop museum stores. Visit, learn, and cherish them year round — and buy from their stores that which you need and adds good memories to your life and house. Buy something unique, not a mass produced item with a name stamped on it. You don’t need a special day to shop online. Those retailers are there 365/7/24. They will always appreciate your business — especially the small businesses and creative artists. You don’t need a special day to donate to your favorite charities. They need year-round funding. The holidays — whichever holidays during this time that you celebrate — are primarily about the meaning of that holiday, and celebrating that meaning with family and friends. It is not about crass commercialism and buying everything under the sun, no matter how the media and the marketeers try to convince you otherwise. Thus ends this public service announcement. You may continue with your lunch. Livejournal New User Agreement: Thoughts? This Agreement constitutes a public offer in accordance with Article 437 of the Civil Code of the Russian Federation. By using the Service, including every access to the Website pages by any means, User unconditionally accepts this Agreement in its entirety. Any User who does not agree with the terms of the current version hereof in full or in part shall discontinue using the Service in any way. The User shall be responsible for any possible loss or distortion of information and for other consequences of any nature which may occur due to the User’s breach of any provisions of the Agreement. The technical data transmitted to the Service by the User’s software as well as any other information transmitted by the User to the Service shall be available to the Administration and may be used at its own discretion legally, including targeting the advertising to User. In respect of any Content which constitutes intellectual property, User provides to the Administration a non-exclusive (simple) license to use his/her Content in order to provide the Service by reproducing his/her Content as well as by making it public for the entire period the Content is posted on the Service. If User participates in any rankings or if User’s Content is used in any editorial projects of the Service, User provides to the Administration an additional authorisation to modify, shorten and amend his/her Content, to add images, a preamble, comments or any clarifications to his/her Content while using it, and in certain cases based on the Service functions, an authorisation to use User’s Content anonymously. Mark Content estimated by Russian legislation as inappropriate for children (0 −18) as “adult material” by using Service functions. Please note that in accordance with the Russian Federation Act No. 2300-1 dated February 7, 1992, the provisions of the said act related to consumer rights protection do not apply to the relationship between the Administration and Users as the Service is provided for free. I have a number of concerns about this. If paid services (which include permanent services) are not subject to this agreement, as a permanent user, why do I have to agree to it? How can I agree to be governed by the Russian Federation when I have no idea what I am agreeing to. Legal liability for comments? Excuse me? I am strongly considering severing the cross post connection between Dreamwidth and LJ, and leaving LJ as a static account just to preserve the username. I want your opinions on this agreement. Please post them on my blog on cahighways, or on my Dreamwidth account, or on Facebook. I WILL NOT READ COMMENTS ON LIVEJOURNAL. ETA: It looks like if you haven’t approved the new agreement, the DW-LJ crosspost doesn’t work. Good. ETA #2: LJ, it’s been real. Don’t let the door hit you on the way out. There will be no more DW to LJ crossposting, and I do not intend to update my LJ after today. I am not deleting it out of consideration for hard links in posts and such. If you’ve been following this blog over the last few weeks, you’ll know that I’ve been very active and very vocal in the fight with AEA about the rules governing 99 Seat Theatre in Los Angeles. I’ve been championing the value of Los Angeles’ 99 seat theatres, and how they cannot operate on the minimum wage model AEA proposes. In doing so, I’ve been indicating that theatre depends on a triad to stand: the “producers”, who find the funding, facilities, and provide the oversight; the “creatives”, who are the actors and designers that bring the production to life on the stage; and the audience, who is there to receive and appreciate the performance. In fact, I’ve argued that without the audience, there would be no theatre; actors would be like bloggers, shouting into the wind unsure whether anyone is out there. Yet as I’ve watched the discussion fly by, the audience has yet again been forgotten. AEA thinks producers can just raise prices to provide higher wages; the audience will always be there to pay. Those organizing the rallies and marches have gotten many groups to sign on: the Producers League, the Dramatists Guild, writers, stage managers, designers. But where is the audience in all of this? Other than me, the audience’s voice has been relatively silent. Even when the pro99 forces talk about bringing groups together to work towards change, the audience does not have the ability to be a formal stakeholder, as it has no representation. I say it is time for those of us in the audience to united and organize, to have our voice heard. I have decided that the audience needs a singular voice — a union (if you will) — to represent it and to ensure that the needs of the audience are met. I announce today the formation of a new group, the League of Audiences, Fans, and Others Organized for Los-Angeles-Theatre. To ensure that audiences are represented in upcoming talks on the replacement for the 99 seat plan. Change is coming to the 99 seat plan, either through a “no” vote, or by AEA listening. These changes must not be unilateral; the audience must be part of the negotiations. To ensure that audiences have a safe and comfortable performance environment. AEA has the responsibility for actor safety, but who thinks about the audience. I’ve been to shows where the seats were reused from a 1920s theatre, and were so narrow they distracted from the show. I’ve been in theatres where the seats fall apart when you stand up. Audiences need seats of a minimum comfortable width, that are checked so they do not fail. Audiences also need adequate restroom facilities. Audiences need safe parking areas. 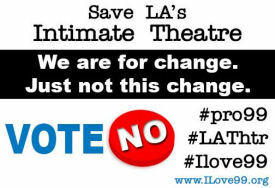 To ensure that audiences can afford theatre in Los Angeles. Los Angeles is not New York (thankfully). We don’t have the tourist dollar that can pay premium prices for tickets. We have an audience that is used to affordable tickets (often due to discounting programs). We want to ensure that at least 10-20% of all tickets are available at a reasonable discount price, for every show. Additionally, parking for shows needs to be both available and affordable. To ensure a growing audience. When you go to many theatres, the audiences are all old and white. That must change. Audiences, Fans, and Others will design a program of audience outreach, encouraging new patrons to try and discover theatre in Los Angeles. Los Angeles’ 99 seat theatre is uniquely affordable, and we believe that if you get audiences hooked on live theatre in the 99 seat theatres, they will move up to the mid-size and larger theatres. We believe Los Angeles audiences are smart and want more than endless tours of “Wicked” or productions of “The Sound of Music”. To fund Audiences, Fans, and Others activities, we will ask all theatres to contribute a small amount from each ticket. Probationary members will be accepted, with modest dues, with proof of attendance of at least 14 professional theatre productions (comedy clubs do not count) in Los Angeles over a 12 month period. Amateur audiences should stick to community theatre, school-based theatre, and productions at the Pantages. I ask you, other audience members, to help me further our goal of organizing the audiences, and to spread the word. Oh, and if you by chance aren’t an audience member… you’re one of those people up on stage… If you are an actor and a member of AEA, then by now you should have received your ballot. Actors, Fans, and Others encourages you to mark you ballot “No” and return it to Election Services forthwith (that is, promptly). We need to fight for Los Angeles’ unique theatre ecosystem and encourage that it lives, so that we, the audience members, have a wide variety of places to see you, the actors, giving your all for something other than minimum wage on stage. We thank you for your sacrifice. I’d like to announce that ACSAC site selection has completed for 2015, and we’ve opted for the Mission Inn in Riverside. The conference itself will be held on the grounds of the Orange Empire Railway Museum in Perris California, about 30 miles south of Riverside. You got me. That’s not really happening. But I had to come up with something for April Fools. In more serious news, there is a change of venue to announce. I’ve been looking at Cybersecurity opportunities, and decided that LA is not the place to be. It’s time to start exploring moving back east. Look through the list and decide on the birthday song you want. Comment on the List of Birthday Songs with your choice. That’s it. I’ll do my best to remember you want a special song (I sometimes forget), and will post it on your Facebook wall when Facebook reminds me it is your birthday. You must have your settings such that either Facebook or Livejournal reminds me of your birthday. Only comments on the List of Birthday Songs count. Selecting your song on this post, or on any of the reflections (Facebook, Livejournal, Dreamwidth, G+) of this post does not count. This is (a) because I need to have only one place to check, and (b) have you ever tried to find something old you posted on Facebook? New song selections supersede previous selections. Birthday wishes are posted to your Facebook wall or sent by PM on Facebook. If Livejournal reminds me, and we are not friends on Facebook and you have posted to your LJ within the last year, I’ll send you a birthday message on Livejournal. If you want your birthday message on any other service, indicate so in your song selection comment. The opinions expressed in this post are not necessarily those of SquabbMerlCo or its subsidiaries. Progenitorivox is not available, anywhere. Offer void in Wisconsin. Any resemblance to actual drugs, living or dead, is purely coincidental. Any unauthorized use of your own judgment in the application of Progenitorivox is strictly prohibited. Progenitorivox may not be reproduced without the expressed written consent of Major League Baseball. Progenitorivox may cause drowsiness or restlessness in lab animals. Do not resume sexual activity while operating heavy machinery without consulting your physician. For erections lasting longer than four hours, insert your own joke here. If you experience psychotic episodes, you’re crazy. If death occurs, discontinue use of Progenitorivox immediately. If symptoms persist, consult your physician. All sales final. Batteries not included. I started blogging/journaling just about 10 years ago on Livejournal. Over there the tradition was to do a birthday post when a friend had a birthday. The problem was, however, that I detested the traditional “Happy Birthday to You“. Having grown up with 1960s childrens TV in Los Angeles, I preferred “The Birthday Cake Polka” (i.e., “put another candle on your birthday cake“) as sung by Sheriff John Rovack, a children’s TV host on Channel 11. This got me thinking about birthday songs, and so the first birthday song poll went up on SpunkyLizard’s birthday (2/1) in 2005. I kept adding songs over the years to come up with the current list. Times change, and communities move. Livejournal is still active, although most of the community there has moved on. The current community appears to be Facebook, and so I’ve moved the birthday songs to Facebook, normally just doing the polka. Alas, Facebook doesn’t make polls easy, and neither does WordPress (the mechanism behind my blog), and so blog comments it is. You may suggest new songs on any of the various posts, and I’ll endeavor to add it. A pointer to the lyrics or artist is appreciated. Everyone seems to be doing end of the year / recap / welcome to the new year posts. I must not succumb to peer pressure. I must not succumb to peer pressure. I must not succumb to peer pressure. Oh hell. For us, our years have a remarkable steady state to them. In general, we suffer the same problems year to year (arthritis, migraines). Work stays about the same (I’ve been at the ranch in the same department for over 25 years now). This may sound dull, but that’s OK by us. It permits us to be there when others need us, and that’s a good thing. I have a sense that 2014 may be another year where friends and family will draw from our stability… and that’s just fine. If someone can say about you that you were there when they needed you, then you are doing something right in the world. I’ll note that the year ended with our daughter demonstrating maturity, which is a great way to end the year. She had gone to a party, had a little to drink, and was starting to feel uncomfortable with the situation. So she called us to come and get her and her car, which we did – no questions asked. Her doing so was demonstrating that what we’ve taught her has sunk in, and I’ll say again what I’ve been saying a lot this year — I’m proud of the awesome young woman my daughter has matured into. I hope 2014 brings her more of what she’s looking for. Alas, the morning of 2014 seems to be bringing me something I’m not looking for — another headache. Far too many of my light migraines in 2013; this is a trend that I hope breaks in 2014 (although I can be thankful that the debilitating migraines are infrequent — the last was the last day of ACSAC). Perhaps the Excedrin will work; perhaps I’ll need a triptan. If I’m lucky, perhaps this will be the last for while. What do I wish for in 2014? Primarily, I wish the government gets its act together and decides that it wants to govern responsibly and in the interests of the Nation, as opposed to the interests of the party. Much of the stress of the last few years has occurred because the government can’t figure out how to fund itself for more than a month or two at a time, and the inability to budget and fund on a longer term basis makes tactical and strategic planning impossible — and costs the government more money. The preoccupation with all the short term financing bills also means that the government cannot provide its proper oversight roles in a number of areas both internal (the Agency) and external (financial markets and abuse). I also wish for the health issues of family and friends to stabilize. I wish my headaches become less frequent and my wife’s arthritis pains lessen and the flares be few and far between. I also wish for stable health situations for our family’s siblings, cousins, nieces, nephews, those whom we consider family, and for all our friends. May your health be stable, may you find the healthcare you need affordibly, and may you heal fast. If you are dealing with aging parents or relatives, may the wish above be doubly true. As for the world, I wish we see a lessening of hate. Hate is consuming our culture: be it the large hatred that drives terrorism and terrorist acts (including school shootings), or the little hatred that we see in the increased bullying and on the comment pages on the Internet. Rodney King famously asked, “Why can’t we all just get along?”, and it is a great question. May 2014 bring increased understanding between people, and the realization that we all don’t need to agree, and that we don’t need to hate those with whom we disagree. May we all learn increased tolerance, and realize that the actions of others often don’t affect us at all (and may all those fighting gay marriage realize that the only thing affecting the relationship between two people are those two people, and that a gay marriage is no threat to your marriage). Take care, and may 2014 be a great year for you. OK, I’ll fess up. I’m not running for state senator. I didn’t get a lot of “yeah, go for it”, nor do I think I could do the “press the flesh” and raise all the money. Although Kickstarter is a great idea given the success of Veronica Mars, I don’t think you can use it for political purposes. Certainly, you couldn’t give patronage positions via Kickstarter. P.S. : Another clue was the music on the original post. Still, I wasn’t joking about the issues of concern, and I intend to keep talking about those. I’m also extremely bothered by the response to the Google Doodle. I do believe our government has gotten dysfunctional, but I think I have too much common sense to ever be elected to Congress, let alone the state legislature. However, if anyone ever wants to appoint me to the California Transportation Commission, I’d give it serious consideration. But then again, I would still love to see “Cats Don’t Dance” on the stage. I’ve had it with the partisanship of politics — people unable to compromise for the good of the country… people thinking only of their party first, and the country second. I’ve had it with people putting down solutions without proposing something better. Fine, so you don’t like Obamacare. Before you do a blanket repeal, how about proposing something that achieves the same goals in a better way. For example, if we are to get truly affordable health care, how about we standardize and control the costs of health care. If users of health care were charged the actual cost plus a reasonable profit — across all users, instead of the inflated and arbitrary costs that are done today, we would probably see a net lowering of costs. We should limit insurance companies to reasonable profit, and insist that executives thereof make no money than the doctors. I’ve had it with how we treat the defense industry. I’ve been working in the defense industry for over 25 years. We’ve gotten so dysfunctional with our budgeting processes that it actually costs more money to make things. Companies cannot plan effectively without a long term funding plan. I’ve had it with a government that is not serious about cybersecurity. This is true not only at the Federal level, but at the state and city level. We need to ensure there are state procedures to protect all the information collected by the state. The approaches currently taken by the state legislature are a joke; we need people knowledgeable about cybersecurity in charge. The state needs to do something to repair its crumbling infrastructure. Our road system, which is the backbone of commerce in the state, is crumbling. Bridges and other structures are in disrepair, and it takes far too long to get anything fixed. Further, if we’re going to be spending money on transit, it needs to be on modalities that will be used, are cost effective, and that cover movement of people where they need to move. I’ve long believed that complaining about a problem is not the way to solve a problem. Given the effects of the sequester, now is as good of a time to do something about it as any. There are cutbacks going on, and everyone is running scared. Further, my state senator just won election to the LA City Council. So, starting today, I’m going to explore running for public office for my state senate district. Anyone want to help? What’s the first step? According to the website, I either need to pay a filing fee of around $960 or collect 3,000 signatures. I also need to file some statements of intent and open a campaign account. I’ll need money. I’m horrible at rubber chicken dinners and fundraising. I wonder if I could use Kickstarter? I could offer some wonderful patronage positions as incentives.